Add/Edit Candidates : This feature can be used by the author(s) to create any number of candidates which can take the exam. 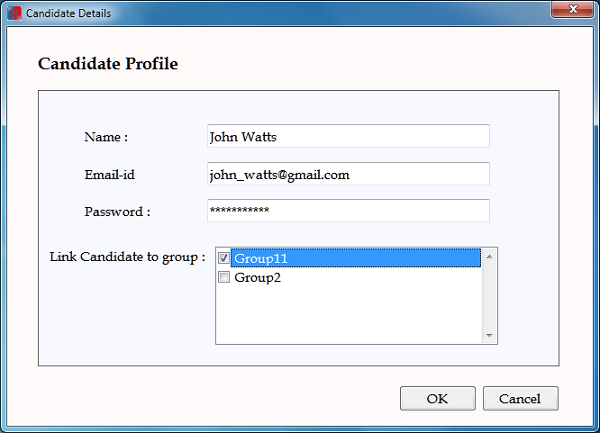 Each candidate will have a separate login using his/her email id and password. Candidates will be able to view only their own test results. 1. Add Candidate : To use this option click "Add Candidate Details" in the main Author menu. Email Id : Each candidate should have unique email id, this will be used for login before candidate can take exam. Password : Any combination of alpha numeric characters. Length should be between 6 to 15 characters. Link Candidate to Group : Each candidate must belong to a group/class. By default candidate will be added to default group. More details about creating group can be viewed under Add Group section. Enter all the details and click "Ok" to add the candidate. 2. 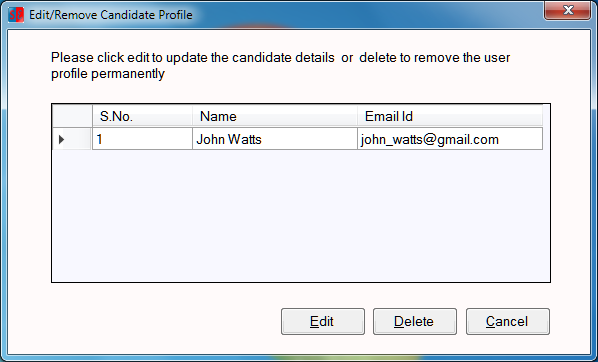 Edit/Delete Candidate : This option allows author to edit candidate details or remove the candidates completely. To use this option select "Edit/Delete Candidate" option from main Author menu. A list of all the candidate will be provided, select the candidate whose details you want to edit and click on "Edit" button. All the details of the candidate will be provided. Make any changes required and click "Ok" to save. To delete the candidate select the candidate from the list and click on "Delete" button.